Joe is a male, human golfer in the Mario Golf series, first appearing in Mario Golf for the Game Boy Color. It was said that Joe used to be a disco pro when he was 18, but later turned to golfing. He has managed to keep his flair through the years and commonly uses dance terms to describe his skills. Joe is known to be a bit of a showoff, however he nonetheless proves that he is a balanced golfer. In Mario Golf, he was one of four characters that the player could choose from at the beginning of the game and train however the player like. He could then be uploaded to the N64 version for more training. He is voiced by Mike Madeoy in the latter. In Mario Golf: Advance Tour, he defeats Putts for the championship title and becomes the current champ of the Marion Singles Cup. He decides to partner with Putts for the Marion Doubles Tourney. When it is taken by Neil and Ella, Joe tells them to keep training, so one day they could become as good as Kid. In Mario Golf, Joe has brown hair tied back into a ponytail. He wears an orange-collared yellow polo shirt, a brown belt, and white slacks. His golf shoes are auburn brown and he wears a yellow golfing glove. His trademark is a pair of dark sunglasses over his eyes. There is a green earring on his right ear. 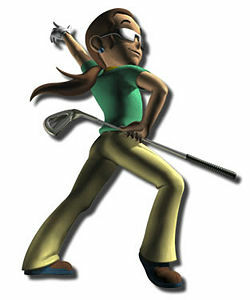 In Mario Golf: Advance Tour, Joe retains his ponytail, earring and his trademark shades. However, he now wears a yellow-collared green polo shirt, beige slacks, brown and blue golfing shoes and a white golfing glove. Aren't I cool? Yeah! But I am not Aladdin! Is that an old story? Well, that does not matter. I am a cool college student. Although I started playing golf recently, it is easy to play golf when you have a sense of rhythm trained with dance. But if you see your score not growing quite well, maybe golf is a deeper sport than I thought? ↑ 1.0 1.1 Confirmation from Mike Madeoy via e-mail. This page was last edited on March 18, 2019, at 22:52.